Remember TCBY? They were one of the original frozen yogurt chains and their soft-serve frozen yogurt tasted like ice cream. It was yummy. Most high end ice cream scoop shops offer frozen yogurt as well, but it’s the same consistency as the ice cream; if it wasn’t labeled, I’d never know the difference. I only order it to feel virtuous. I am not a fan of real yogurt, the kind you buy in the supermarket dairy case. Even doctored with bits of chocolate, or flavored like cheesecake, it doesn’t appeal to me. And yes, I’ve tried the Greek yogurt. No, thank you. My daughter coaxed me into a frozen yogurt store in Harvard Square a few months ago, BerryLine, on Arrow Street. She’d been there and swore it was the most fabulous frozen yogurt she’d ever had. I tried it and was sorely disappointed. It was unlike any frozen yogurt I’d ever had before. It tasted like – yogurt. You can imagine, then, how underwhelmed I was to hear that she’d visited a new shop in Lexington, called Fruitee Yogurt, that was even better than BerryLine. Did she mean better better, more like ice cream, or better worse, more like yogurt? There was only one way to be sure; I had to check it out myself. Fruitee Yogurt reminded me of an old-fashioned automat. It’s self-serve. One wall has half a dozen soft-serve machines embedded in it. There are no instructions, no clues. Apparently the user interface is supposed to be so intuitive that anyone can do it. Alternatively, the cost of the product must be so low that they can afford to eat the cost of the yogurt that ends up on the floor, or gets licked off the hands and arms of the uninitiated. Okay, so it’s not that hard, not like figuring out how to eat a lobster the first time, but I was happy I had my husband there to coach me through it. First, however, I asked a teenaged employee to pull me a dab so I could taste a flavor. With aplomb, he squirted just the right amount into a tiny cup. I admit it, I was impressed. Then it was time for the big moment. I tasted the Salty Caramel and… I liked it! At first I thought I could taste a hint of yogurt, but then the caramel took over and I was in heaven. According to an article in the local paper, “Fruitee Yogurt’s yogurts average 25 calories per ounce, and are either low fat or entirely fat-free.” That, of course, doesn’t take into account the add-ons, which in my case were white chocolate bits and caramel syrup, but I still felt virtuous. After we ate, we decided to check out the other new froyo place in Lexington, Orange Leaf. 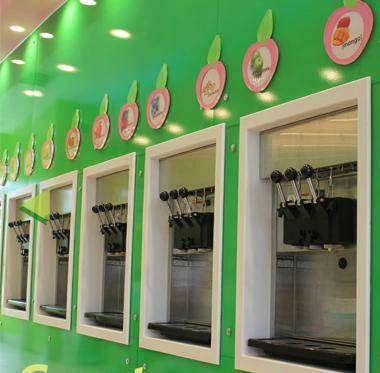 It turns out that self-serve frozen yogurt is all the rage. Orange Leaf is just like Fruitee Yogurt, but it’s much bigger and has more flavors. I tasted the wedding cake (hey, I was there) and it was good. Orange Leaf, however, is a franchise, and as far as I can tell, Fruitee Yogurt is a one off. For that reason alone, I’ve already developed an allegiance to it. 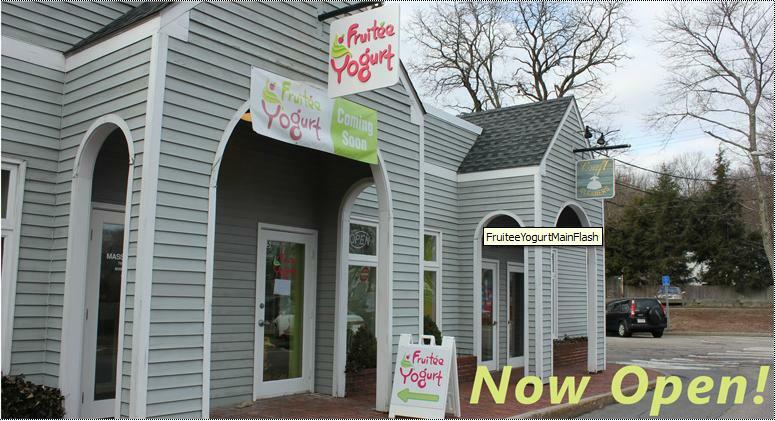 Now the 64,000 dollar question is, will Fruitee Yogurt, which is ever so slightly off the beaten path, be able to compete with Orange Leaf’s prime Mass Ave. location? I’m going to do everything I can to make sure they do. Frozen yogurt any one? I used to be a Rancatori regular after the Lexington Flicks, but now must admit that I’ve been won over by the self-serve wonder of Orange Leaf frozen yogurt. Ice cream is definitely the biggest question of the summer. I must introduce just one more twist to the debate before signing off: have you tried the hand-cranked honest-to-goodness real ice cream at West Concord’s Reason’s to be Cheerful yet? And, Judy, maybe like me, you will be one of the very few who get the Ian Drury reference here. It’s all about the ice cream, that’s for sure. I have not yet visited Reasons to be Cheerful (thank you Ian Drury), but I will put it on my list of things I must do. It shouldn’t be too hard to talk someone into going with me. Re: automat. 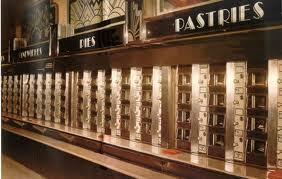 There’s a “lunch” exhibit in the entrance area of the NY Public Library on 42nd and 5th that features an automat wall. No froyo there. I’m a big fan of Truly Yogurt (in Wellesley Square) soft-serve, which is *not* yogurt but is nonfat and has fewer calories than frozen yogurt. I would love to see that exhibit! I’ll make a note for the next time I’m in NYC. Thanks! Will need to tell my daughter about Fruitee…her haunt this summer has been Yeh! (http://www.yehyogourt.com/) on Mall Road in Burlington. I love seeing the picture of the Automat…I remember going there as a Girl Scout more years ago than I can count! Are you in Arlington? Maybe we need to think about our own franchise. Yep, Judy…we do know each other from Dallin…way back when your daughter was in K and mine was in 2nd grade they had swim lessons at the Waltham Y….ringing a bell? And an Automat sounds great! Oh good golly! Of course I do. I didn’t realize that was you. Nice to “see” you here.